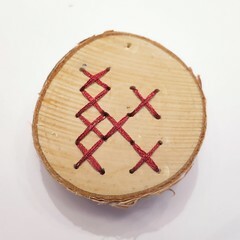 This week was a doing some cross stitching into wood, so get out those power tools. 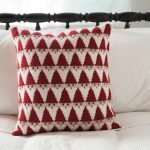 Actually, if you are comfortable with a drill this is quite the easy project. The main thing is being careful with your planning so all your holes are pretty evenly spaced. (Mine could have been a touch better, but I still like it. You can find birch slices in all different sizes in most craft stores these days. You want some that are on the larger size, 2″ – 3″ for this project. 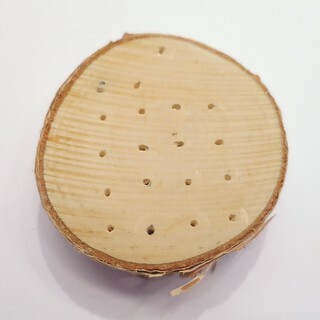 I’ve even seen them with jute hanging loops already on them, though that added a lot to the cost, when I can drill a hole and put jute through it myself. 1. Figure out the design for your initial, I suggest you keep it pretty simple. 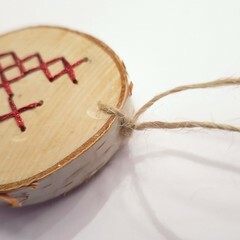 You can find lots of cross stitch alphabets online. Using a ruler draw out a graph the size you want your stitches to be. Keep in mind you can’t have them do small that you can’t drill out the holes because they are too close together. Mine were 3/8″ x 3/8″. I probably could have gone down to 1/4″. 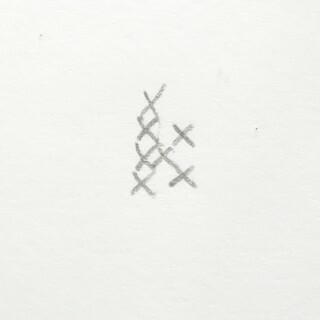 Draw in your X’s. 2. 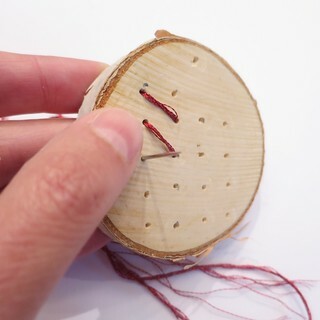 Use the needle to poke holes in the paper where you will need each of your holes to be drilled, the ends of each stitch. 3. Carefully drill a hole through at each mark. Use the smallest drill bit you can that still allows your needle to go through. 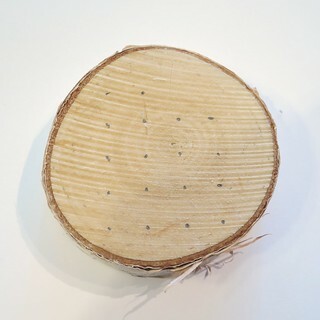 Drill a hole at the top of the wood slice for the hanging ribbon. You may want to use a bigger drill bit here, but I didn’t bother. When finished, sand if necessary. 4. 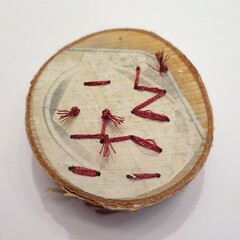 Cut a piece of embroidery floss and knot one end. 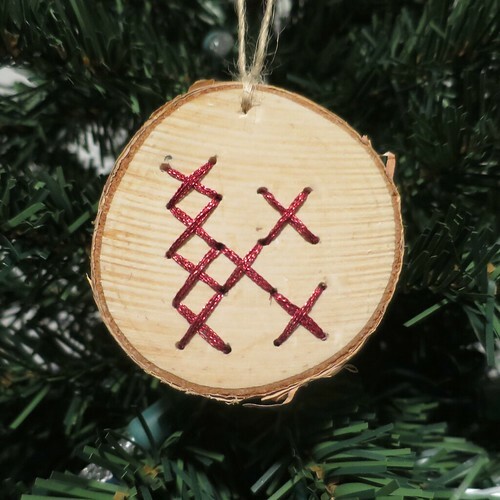 I used all six strands in the floss to do my ornament. 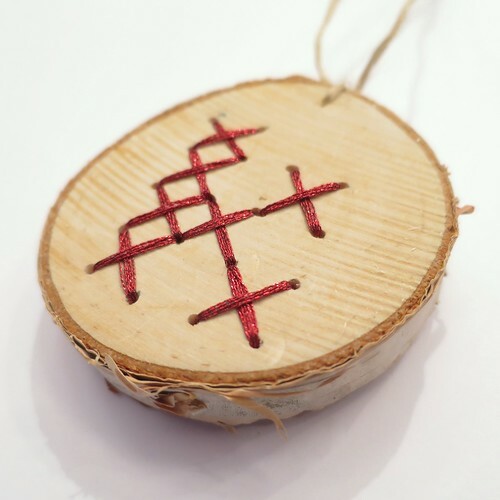 Using the tapestry needle cross stitch your design onto the wood slice. Make sure the thread lays evenly and tightly on the wood with each stitch. I had to go back and fix a few strands after this picture. Knot off at the end. I found it was tight to pull the needle through in the holes I had to go through more than once. Pliers made it much easier to grip the needle and pull it in those spots. 5. I like to make sure my embroidery floss knots stay knotted, especially with the metallic floss, so I put a little glue on them. 6. 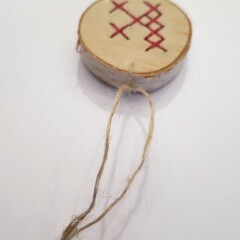 Thread a single strand of jute twine or thin ribbon through the hole you made for hanging. Knot it against the wood slice. 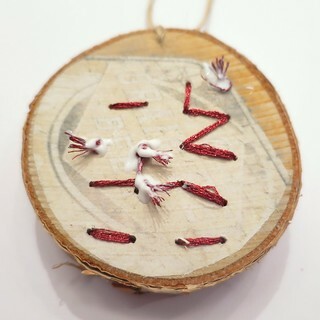 Then tie the ends together to form a hanging loop. 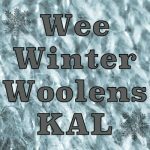 4 years ago by Kat in Advent Calendar Project , Christmas , Craft Projects , Crafts , Embroidery , Embroidery Projects , Holiday , Needlecraft , Projects | You can follow any responses to this entry through the RSS feed. You can leave a response, or trackback from your own site. 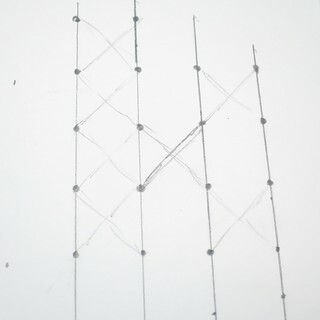 To easily make the holes even, use graph paper.